Carbery - Sports nutrition launches tracked have increased significantly since 2012 and show no signs of slowing down, featuring a CAGR (2012-2016) of +12.6%. Convenience is a paramount positioning within the category, being featured in 8 out of 10 launches tracked in 2016. Brain health is a growing category for product launches, and within this space, certain botanicals are gaining recognition for their ability to provide a mental boost. Baby & toddlers remains the leading market category for brain health claims. 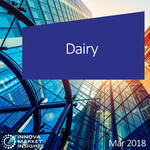 Dairy protein application in the food and beverages has seen a CAGR of 4 percent (Global , 2014 - 2018 ). The fastest growing market category featuring dairy proteins is sports nutrition, with 1 in 4 launches in this category containing dairy proteins. Products featuring bone & joint health claims are on the rise, with Innova Market Insights data showing a compound annual growth rate of 13 percent between 2013 and 2017. Food and beverages with prebiotic ingredients are on the rise, showing a CAGR of 13 percent (Global, 2013-2017). Food and beverages with vitamin ingredients are on the rise. Often highlighted front of pack, vitamin C is the most frequently seen vitamin. The inclusion of vitamins is underscored in a vast array of product categories, ranging from bakery, soft drinks and dairy, and more. Arla - Boundaries are blurring as sports nutrition continues to move mainstream, pushing a growing interest in proteins and convenient formats. 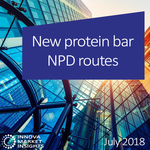 In this space, protein bars are seeing impressive NPD. Sports-related claims are gaining ground in mainstream food and beverages. Moreover, within in sports-related nutrition, “better-for-you” claims have increased their market penetration to 49 percent in 2017, up from 42 percent in 2013. Sunflower oil is the most used unsaturated oil in new F&B launches tracked with a CAGR of +19.9% (Global, 2013-2017). Better-for-you claims are increasingly observed paired with unsaturated oils in F&B. New products with these claims increased with a CAGR of +11.9% (Global, 2013-2017). One in five new product launches in the Dairy category in 2017 was a Spoonable Dairy Yogurt. Milk & Milk Drinks and Cheese – Semi-Hard & Hard are the following categories with most product launches in the same period. The biggest market category for probiotics application globally is Dairy, followed by Baby & Toddlers and Bakery. Dairy indulgent products with probiotics are in tune with the top trend “Mindful Choices” identified by Innova Market Insights in 2018; these products embrace an holistic well-being approach. L-Carnitine is enjoying significant growth (2017 vs 2012) of +30.6% in food & beverages with sports related claims. Further innovation is taking place as the mainstreaming of sports nutrition accelerates. Botanicals – A market set to bloom? New product launches tracked with botanicals have increased over the past years and feature a positive average annual growth. Further new product development and innovation featuring botanicals is expected.